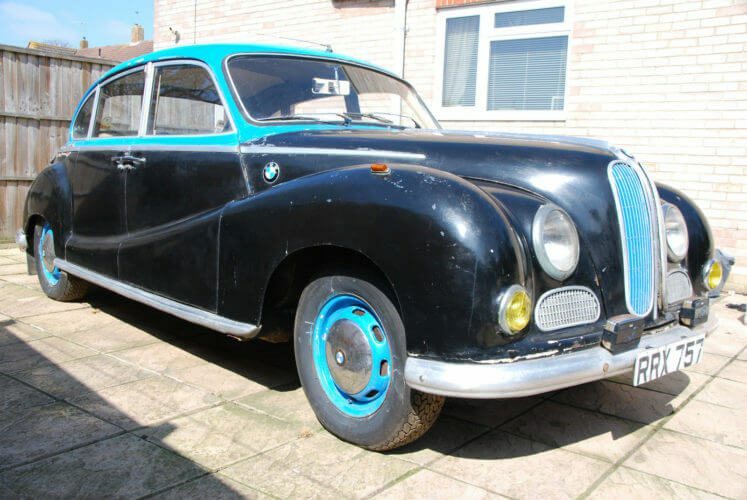 The BMW 502 was launched in 1954 and was an upgraded version of the previous BMW 501. They were famously nicknamed the “Barockengel” or “Baroque Angel” by the German public for their swooping lines and elegant detailing. An attempt by BMW to re-enter the luxury car market after the war, the 501 and 502 had an advanced live rear axle arrangement that offered unparalleled levels of comfort. It also had a very strong chassis which provided superior side impact protection for a car of its era. Advancements such as these when combined with Peter Schimanowski’s body design, left BMW with a very heavy car. Its 65BHP 1971cc straight six which was mated to a four speed manual transmission, was underpowered for the cars weight. 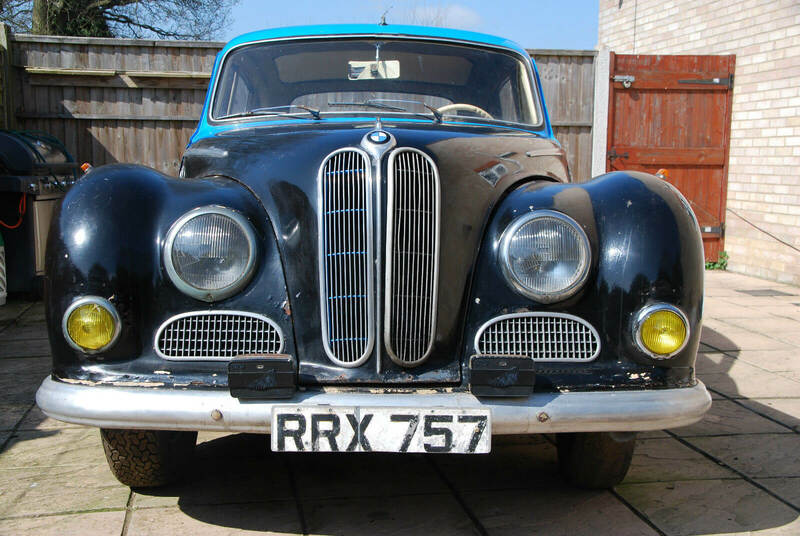 BMW addressed this in 1954 with the launched of the 502 which debuted with a much improved 100BHP 2,580 cc V8. This new engine was the first new German V8 to be built after the war and also the world’s ﬁrst light-alloy engine to enter standard production. The 502 also featured additional chrome and interior enhancements, further increasing the luxury image of the Barockengel. By the time production came to an end in 1963 over 22,000 had been built. The BMW 502 offered is a very rare 1955 model which was imported into the UK in 1959. It was stored for 30 before recently emerging from its slumber. The seller states that the head was removed from the engine due to a gasket problem which was never fixed. The head is still off the engine though a spare engine and rear axle are supplied. 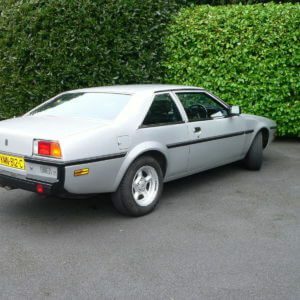 The car was originally cream but was resprayed in 1984 to its current black and blue colour scheme (which actually looks like it was brush painted). We’d return it to its original cream colour asap as the current combo simply does not work. 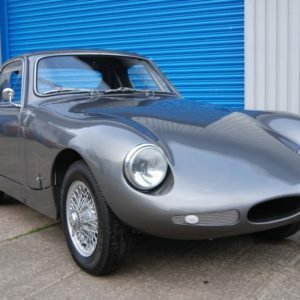 The seller also states that there is a story that this particular car belonged to the actual designer. We assume this refers to Peter Schimanowski himself. Attempts to verify this hasn’t yielded any information. But if true it would be a great bit of history to assign to the car and would warrant further investigation. 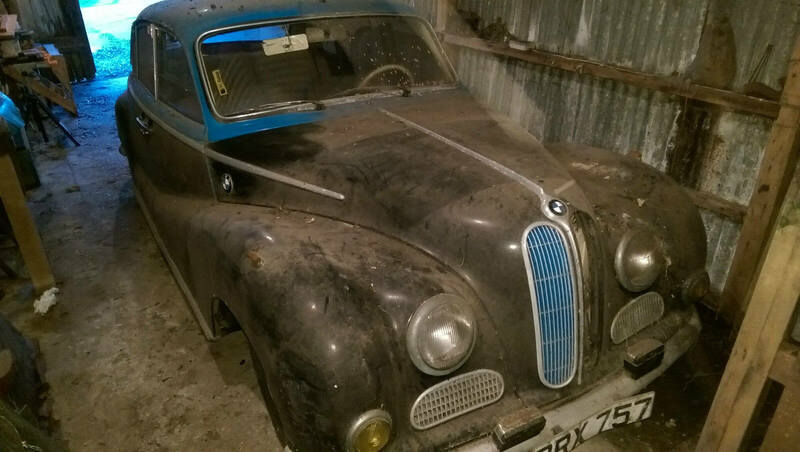 This BMW 502 is clearly in need of restoration but looks remarkably solid for a sixty year old car and the photos suggest that most of its trim and fitting appear intact. As 1950s luxury cars go, this one really fits the bill. 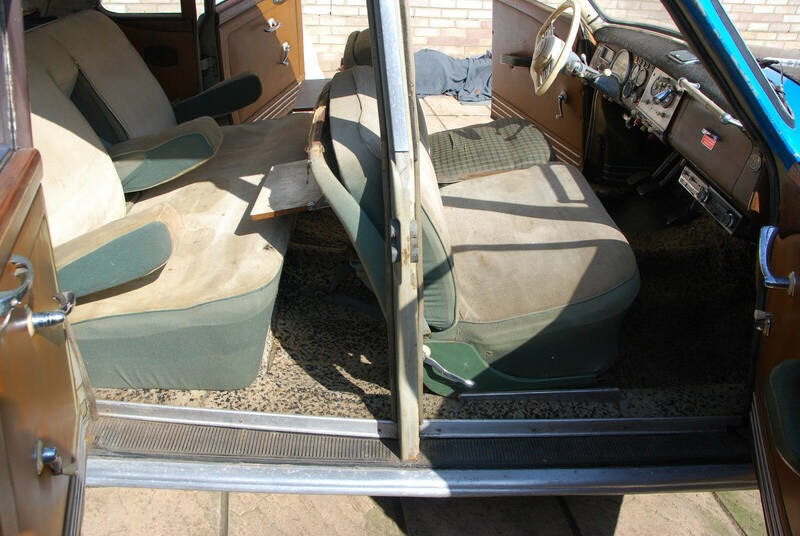 The suicide doors are a great feature and while the interior is tired and worn, you can tell it was top of the range in its day. 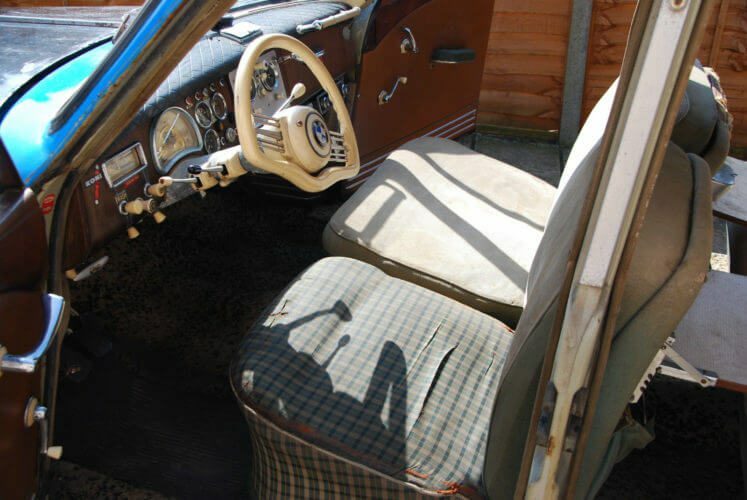 A great detail are the three rear arm rests, meaning passengers had maximum comfort. Do modern day Roll Royce’s have 3 rear arm rests? It actually looks like that the centre arm rest can be zipped closed which is interesting. Added to that are the rear picnic tables. Upfront the steering wheel looks like it came straight from the Batmobile. It really is unusual and brilliant. The dashboard is a classic mix of wood and chrome with a few non standard labels affixed here and there. No doubt the dashboard gauges and electrics will need a thorough inspection to check for any bodge jobs done over the years (hinted at by those labels). We also love the quilted dash pad which further adds to the luxury feel of the cabin. Unfortunately the seller doesn’t provide a photo of the engine bay so we can’t tell what state the V8 lump is in. Hopefully it hasn’t seized after having its head removed and sitting for so long. The listing does state that the engine is a 4.0ltr V8. As far as we know the BMW 502 only every had a 3.2ltr V8 as the largest engine. Perhaps this one had a re-bore or its simply a typo. 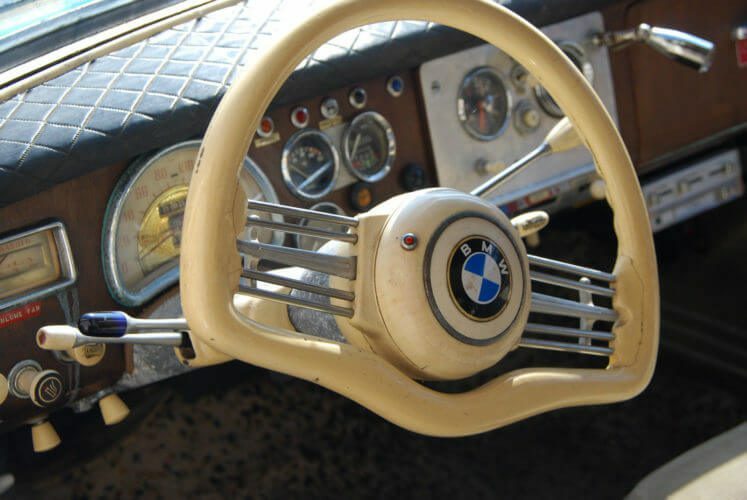 The BMW 502 has wonderfully sculpted lines. Baroque Angel was a very apt nickname. The front has the classic elongated BMW grill. Those covered spotlights look so out of place. We love the shape of the boot lid and the placing of the V8 badge. Very elegant. Suicide doors and classic cars work so well together. The height of comfort. 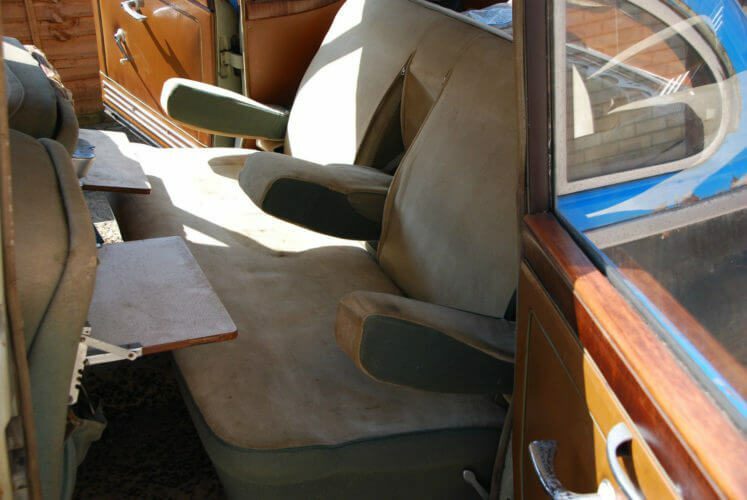 We wouldn't mind being chauffeured round with seats like these. That steering wheel is so cool and not what you'd expect from BMW. We're just trying to picture how wonderful the interior would have looked when new. The shed it was stored in doesn't look like it was 100% dry but at least it was out of the weather. 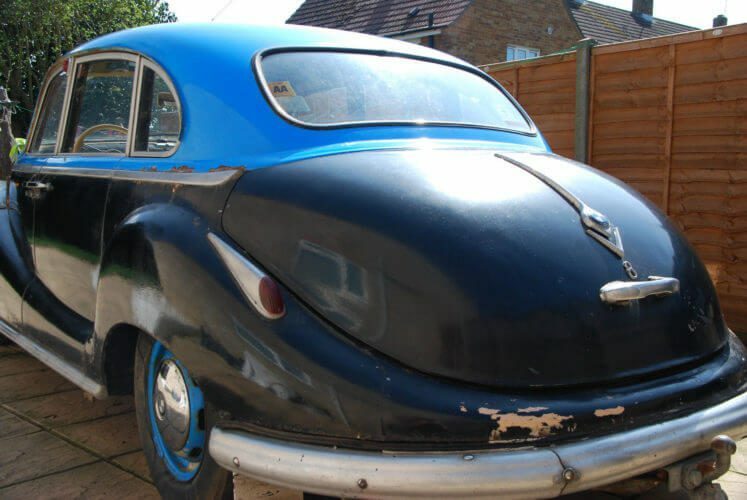 We think this is one of the most exciting restoration projects we have featured to date. 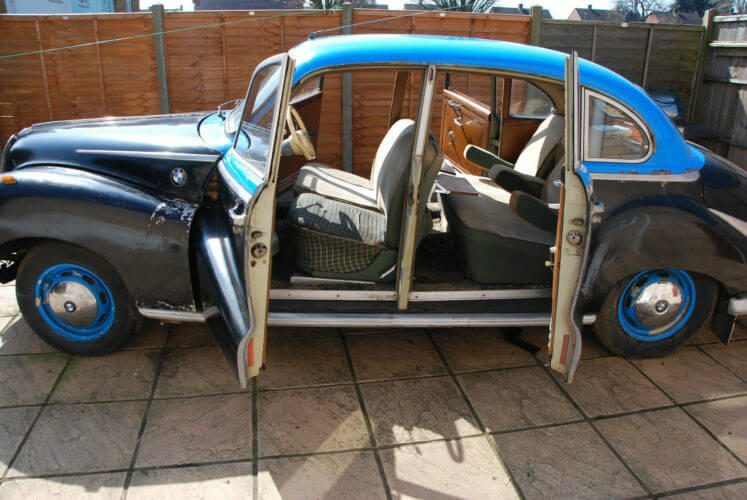 We’ve never seen a BMW 502 before and absolutely love its swooping curves and the air of opulence the interior has. With a complex suspension and a large amount of metal, this is not going to be a weekend restoration project. Who knows what rust gremlins are hiding behind that paint job. And that V8 will certainly need a complete rebuild after sitting for so long. However a car as graceful as this deserves a complete nut and bolt restoration. It is a fabulous glimpse of post war BMW and their efforts to return to the luxury car market, efforts which very nearly bankrupted the firm. If we had the time and the budget we’d love to take on this Barockengel and return it to its former glory. This BMW 502 is located in Portsmouth and the current bid is is £1,550 with the reserve not met.